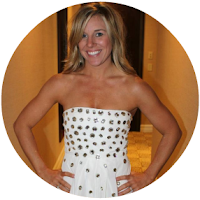 Sweat and Sequins: Gettin' Busy in the Kitchen! Gettin' Busy in the Kitchen! 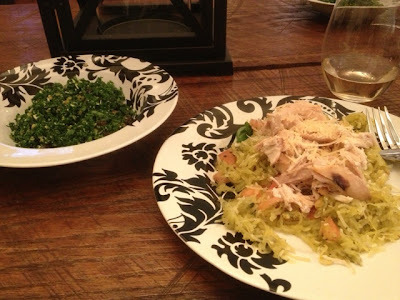 I made Kale salad and Pesto Spaghetti Squash with Rotisserie Chicken for din din! I was so pleased with how everything tasted and more importantly Dave loved it!! There are two great places in Nashville (Tavern & Kayne Prime) that have an awesome Kale Salad! I found the recipe on eat-drink-smile.com via Pinterest! I only used normal raisins. It was cheaper just to buy one bag of those! I used walnuts and shredded parm. cheese! 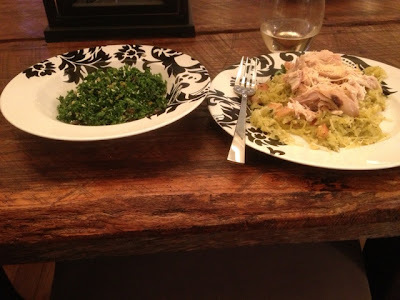 It was perfect and enough to have as a salad with tomorrow night's dinner! This was so good and SOOOO healthy! I had never cooked spaghetti squash before! It was so easy and I loved it! I found this recipe on http://theskinnyconfidential.com. I cooked the squash in the oven instead of boiling it and added rotisserie chicken. Pre heat oven to 375. 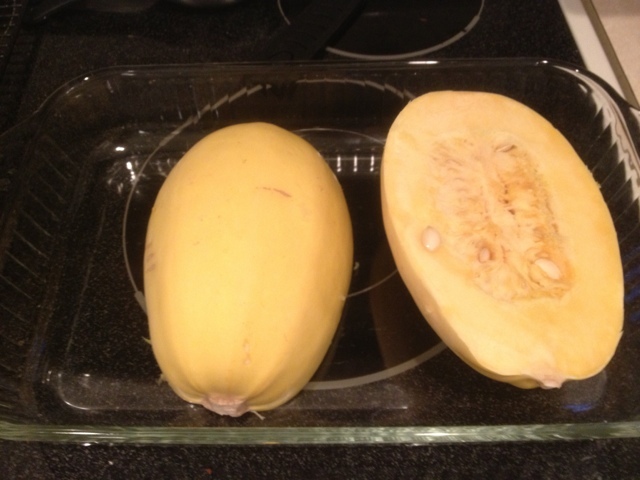 Cut squash in half with a serrated knife and remove seed portion. Add to 1/2 cup of water to a casserole dishwater and lay halves with the skin side up. Bake until tender for 30-35 minutes. Allow to cool enough to handle. Use a fork going to lengthwise, scrape entire squash until you’re left with just the skin. Discard skin. 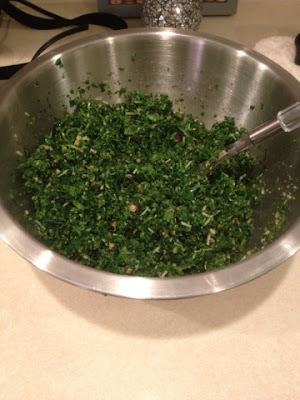 While still warm, add pesto, cheese and salt/pepper and toss. Cook pine nuts stove top on low heat for seven minutes. 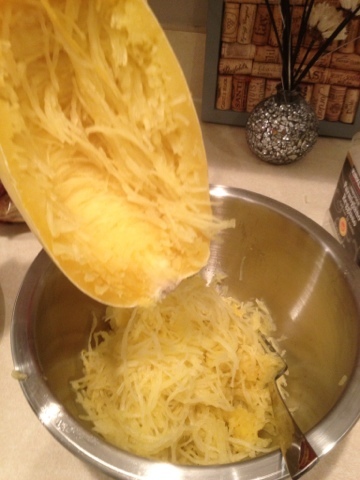 Add nuts, a dash more cheese & fresh basil on top of spaghetti squash. Squeeze lemon. I added chicken and then put it in the microwave so that everything was the same temperature and the cheese melted on top. Tomorrow is Jordon's birthday, (Also known as Love Always, Nancy J) We are all on a healthy eating kick at the office and she is getting married this year so I tried to make this as low-fat and sugar free as possible. It is a Paula Dean recipe "Lightened Up" The icing turned out a little thinner than I would of liked but it tasted so good! Preheat the oven to 350°F degrees. Spray two 9-inch round cake pans with nonstick spray. Line with wax-paper rounds; spray with nonstick spray. Puree the strawberries and jam in a food processor. Set aside. 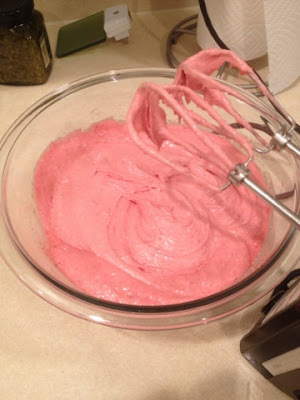 Combine the cake mix and gelatin in a large mixing bowl. Beat in the strawberry puree, egg whites, oil, and water with hand mixer at medium speed until thickened, about 2 minutes. Divide the batter evenly between the pans. Bake until a wooden pick inserted in the center comes out clean, about 20 minutes. Let cool in pans 10 minutes. Invert the layers onto racks and remove the wax paper; let cool completely. For the frosting: With clean beaters, beat the cream cheese and butter in a medium bowl with a hand mixer until creamy, about 2 minutes. Beat in the jam and the strawberry extract. Gradually add the confectioners’ sugar, beating until smooth. 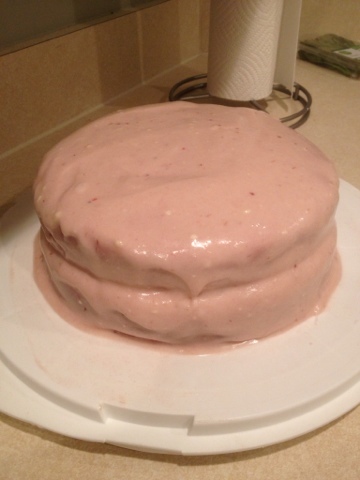 Place 1 cake layer on a serving plate. 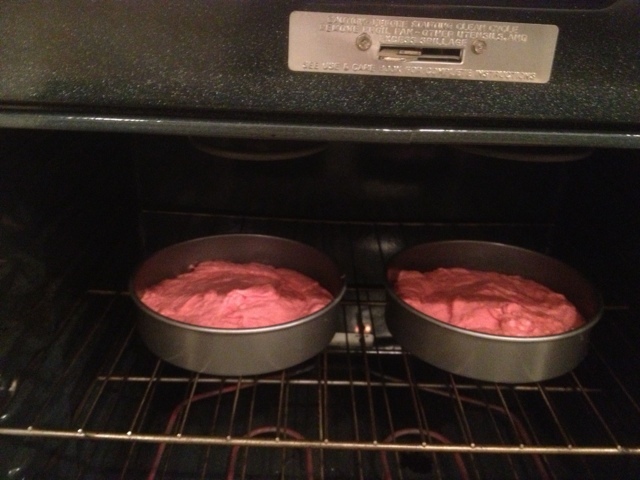 Spread 1/3 of the frosting over the cake layer. Top with the remaining layer. Spread the remaining frosting over the top and sides of the cake. Garnish with the strawberries, if using. Ahh! You rock! I cannot wait to dive in!!!!! this cake looks delish! gotta try it out.